During his 1956 presidential campaign, a woman called out to Adlai E. Stevenson: "Senator, you have the vote of every thinking person!". Stevenson called back "That's not enough, madam, we need a majority!" Once again, you have a chance to vote for your favorite mod! The modding community Doomlab is holding a running Top 100 BF2 Mods topsite listing. You can vote for Forgotten Hope 2 by clicking the banner above or the graphic below. Some other mods have a head start, so we have some catching up to do! Vote for honor, vote for love, vote for no reason at all, just Vote! You can share your feelings of outrage or triumph on our public forums. Be sure to check back soon for new updates and to vote some more! Hello folks, and welcome back for another update of the Forgotten Hope Mod. First of all, a little news about Bug$. His wandering days will come to an end on the first of July, and he should be back full time, as soon as he can get connected. Ok, on to the goodies! Todays update is all about wheeled transport. 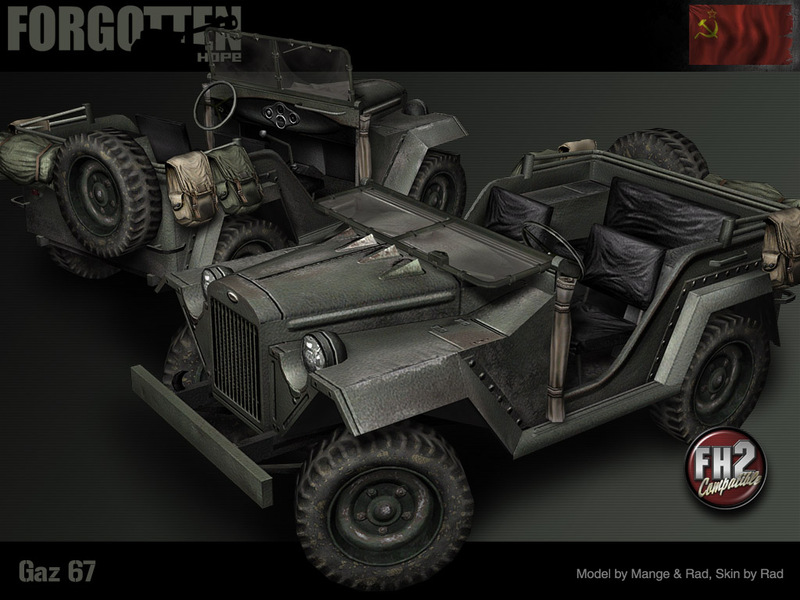 Each of these vehicles should see the elephant in Forgotten Hope 0.7, but were modeled and skinned with the requirements of the BF2 engine in mind. This means they will all be available for use in Forgotten Hope 2, with a minimum of extra tweaking. 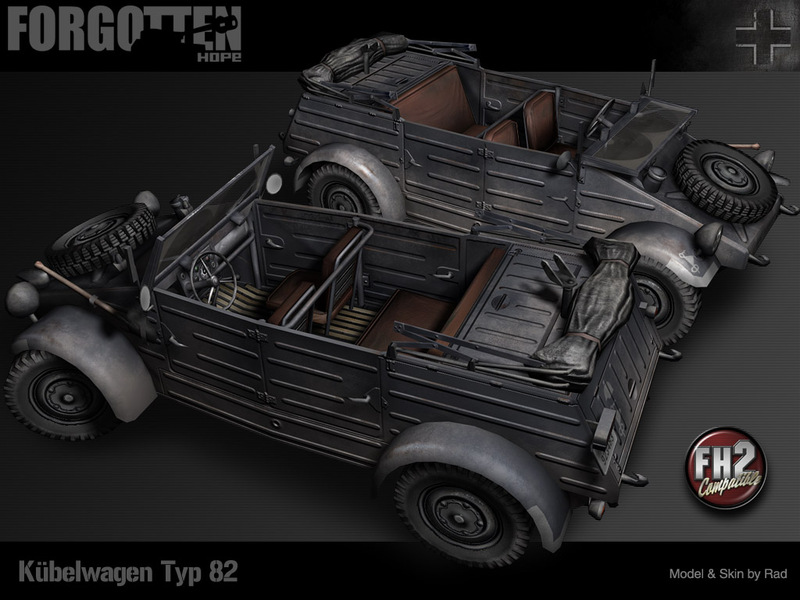 The first model on the runway is the new Kubelwagon Type 82, which was modeled and skinned by Rad. This vehicle was first produced in the late 1930s based on the civilian design that would later gain fame as the VW Beetle. The first version did not peform well, but an improved design, the Type 82, did better, and went into mass production in 1940. The Type 82 had good off-road performance, despite lacking four wheel drive. It was used in large numbers in all theatres of the war where German forces were engaged. The Gaz 67 was the Soviet solution to the need for a tough, compact vehicle with good offroad performance. First produced in 1943, the Gaz remained in production for a decade, and over 90,000 were eventually built. Although harder to keep running than the Willys Jeep it was even better for off-road conditions. Like the new Kubelwagen, the FH Gaz includes a working windshield. 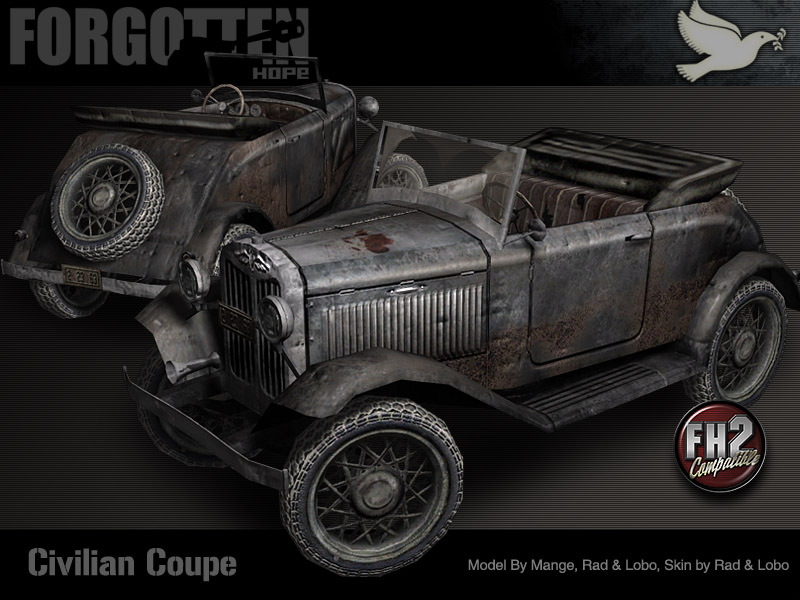 The Gaz was modeled by Mange and Rad, and was skinned by Rad. Next, for a change, we have a vehicle that was not used by any army, a civilian truck. 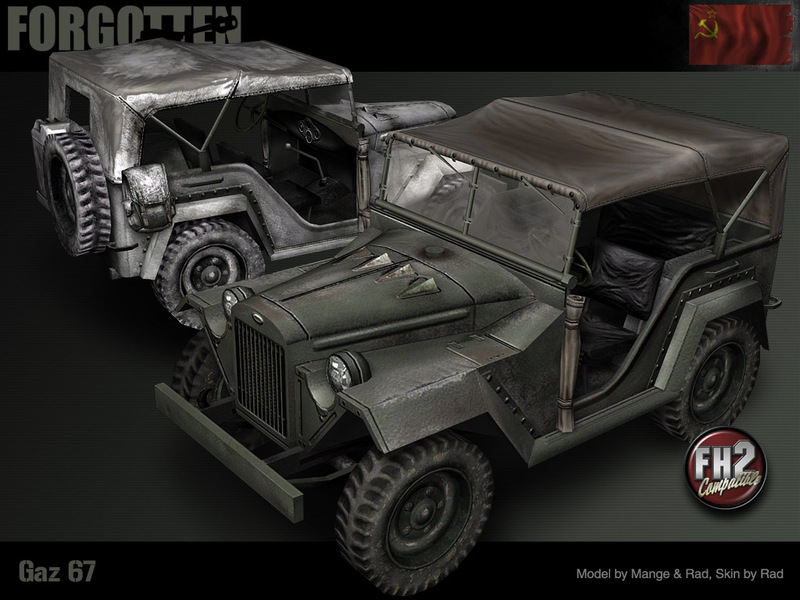 Soldiers that have developed their hotwiring skills may find these vehicles useful for a quick transportation fix. They are unarmed and unarmored, but have room enough for a friend or two in the back. 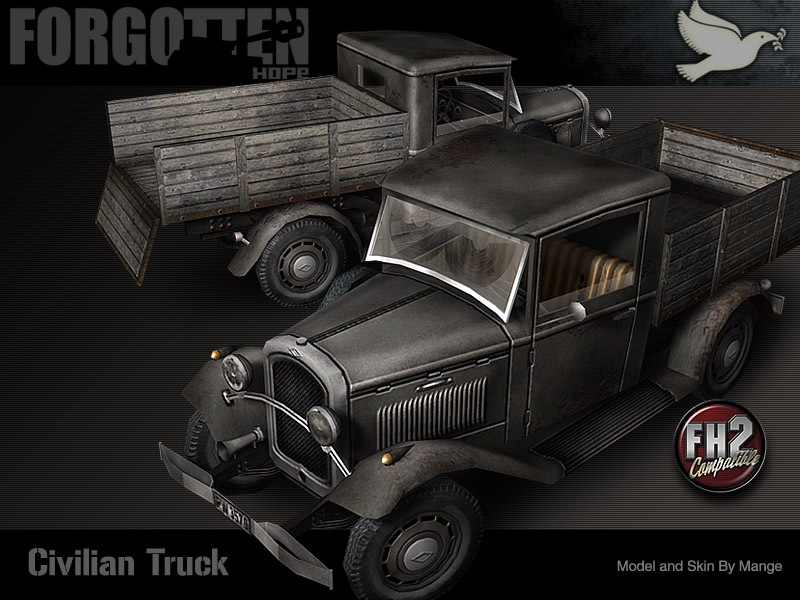 The civilian truck was modeled and skinned by Mange. 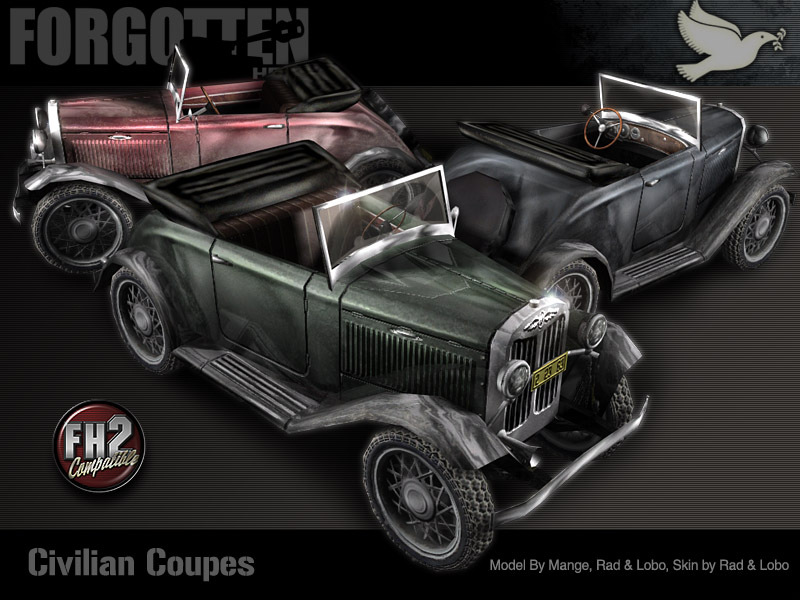 For a sportier look, we have a new civilian coupe in a variety of colors. These are suitable for racing, launching and playing chicken, as well as the more mundane task of getting around the battlefield. The civilian coupes were modeled by Mange, Rad and Lobo, and skinned by Rad and Lobo. Hello and welcome back to another update of the Forgotten Hope Mod. As you might know it is time for the release of the official Fan Mappack Version 5. A few words of explanation first. We think it is better to have support for the maps to extend their life cycle. So this release does not contain all new maps. Instead it will provide you with the latest version of maps that were already included in the last release. We do hope that the changes made (bugfixes and balancing issues based on your reports) will satisfy you and we are happy to say that three new maps were sent in until the announced deadline that were worth a release within the Fan Mappack. As the Fan Mappack is a continuous project you may update your installation of Version 4 with the latest release file. No previous versions older than Version 4 are required and Version 4 is optional. Please note that only new and altered maps have been included in the Version 5 installer. For that reason you might miss some maps if you do not have Version 4 installed and for that reason installation of Version 4 is recommended before upgrading to the file below. An installer for windows is ready as a zipped archive for the serverfiles is as well. Make your pick and enjoy the latest version of the Fan Mappack. That's all for today folks. We hope you will enjoy the new version of the Fan Mappack and maybe you find some time to visit our public forums where we'd like to welcome you to discuss the new release and its features. Do not forget to stop by our site on monday evening at 2000 GMT to have a look our progress with the mod development. Hello folks, and welcome back for another update of the Forgotten Hope Mod. This time we continue our Italian holiday and have some new armor for you. 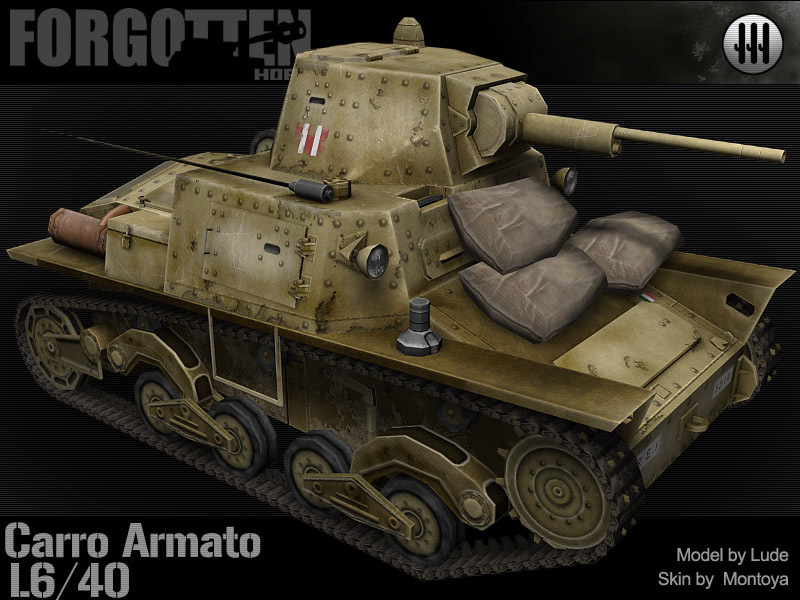 In a previous update you already had a look at the Carro Armato M13/40 light tank and the Semovente da 75/18 Su Scafo M 41 assault gun. This time, you can review their smaller siblings. The first piece on view today is the Carro Armato L6/40 modeled by Lude and skinned by Montoya. Production of this tank began in 1939 and it was considered to be about the same as the German PzKpfw II in terms of firepower and general mobility. 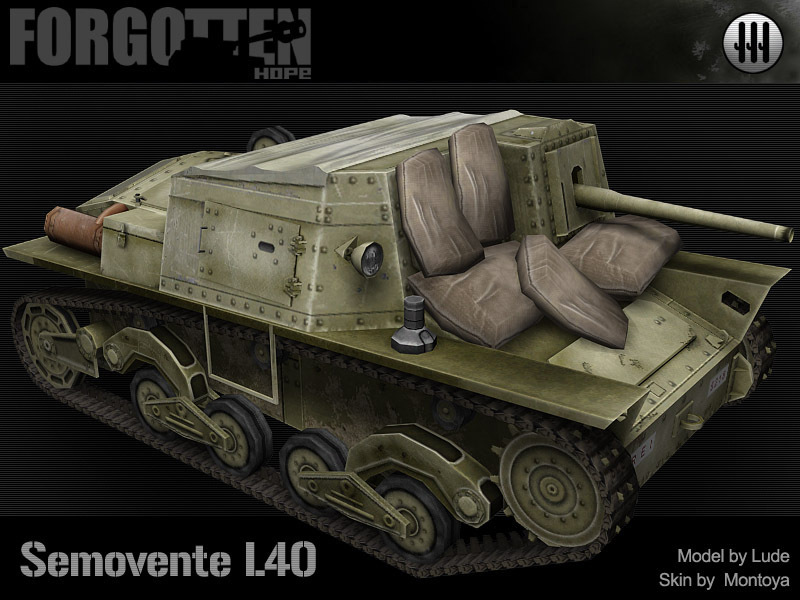 With a maximum speed of 42km/h it dashed through the desert and hunted the enemy, whether with its 20mm Breda M35 gun in the open field, or as a flamethrower-equipped variant in urban regions..
Next, we have the Semovente L40 da 47/32 assault gun once more created by that dynamic duo, Lude and Montoya. Though not designed to be a tank destroyer, it soon fell easily into that role. This was the largest Italian self-propelled gun sent to the Russian Front. A total of 300 were produced between 1941 and 1943, including a command version in which the main gun 47mm L/34 was replaced with a Breda Model 38 8mm machine gun. And since we got quizzed last weekend for not mentioning D-Day, we want to give some historical background about the 12th of June. Today, 61 years ago, the first V1 rocket hit London, and the US opened the 5th war loan drive. 60 years ago, on this day, the Allies freed the city of Trieste from its Yugoslavian occupiers. But not only major incidents happened in the past, on this day. There are also small stories to tell. 61 years ago, Pilot Officer Andrew Charles Mynarski, RCAF, died of burns suffered when he attempted free the tail gunner of his damaged Lancaster bomber before bailing out over Cambrai. The tailgunner survived the crash and Mynarski was posthumously awarded the Victoria Cross. We hope you enjoyed the additional information and we are grateful that you decided to stop by the site and check on our progress, be sure to stop by our public forums and discuss this news update. Hello folks, and welcome back for another update of the Forgotten Hope Mod. First of all we have another small web page update for you. Thanks to the help of Orange, Maximilian Weisemann and Guybrush Threepwood the French-language version of the site is now all done and at your disposal. We hope all the French-speaking people out there, account themselves lucky and enjoy the opportunity to be able to review our page in their native language. But that's enough of the preliminary skirmishing. For today's news update we have Italian infantry arms for you. McGibs was really busy and deserves a holiday named after him for the creation of these fancy toys. The most common weapons in the Italian army were rifles as in any other country. But the Italian Army was faced with a critical deficiency in the primary arm of their infantry throughout World War Two. 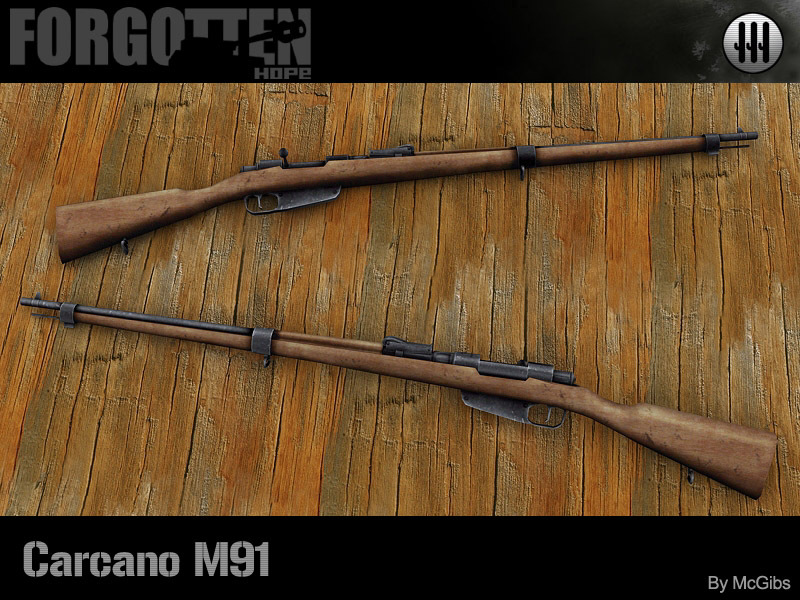 The M1891 had seen service since World War I. As the cartridge was insufficiently powerful, a post-war shift to a 7.35 mm round was made, but only a few weapons had been modified before the next conflict began. As a result, Allied soldiers had the edge on the Italian army in a typical firefight. And the open fields of the desert made the problem even worse. The only advantage was an extra round in the magazine, which was still too small compared to the British weapon, which was loaded with 10 cartridges. Two carbine versions also saw service, the M1891 carbine, which was a straight adaptation of its parent with reduced length. 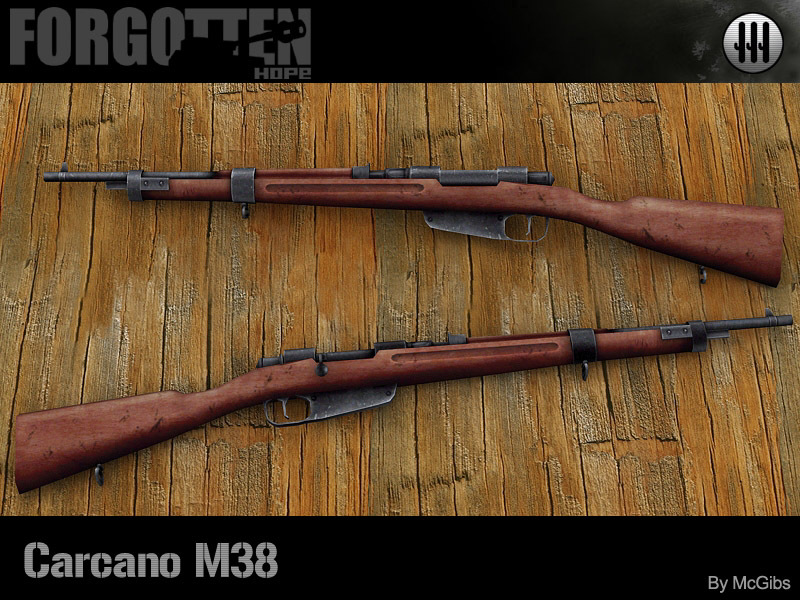 A second version was the M1938 with an overall length of 1015mm and caliber 7.35x52 mm. This later model appeared only in limited numbers. 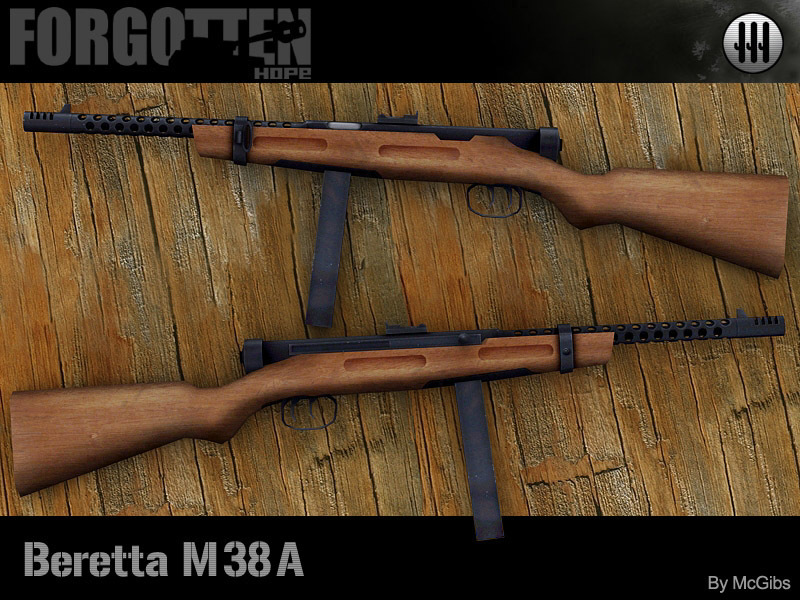 Moving from bolt-action to automatic weapons, the Beretta 38A was the most reliable and prized Italian small arm of World War Two. The Beretta evolved from a pre-war police carbine into an effective submachine gun, and carried over the accuracy of its single shot predecessor into the automatic version. This weapon compares well with its Russian counterpart, the PPSh 41. 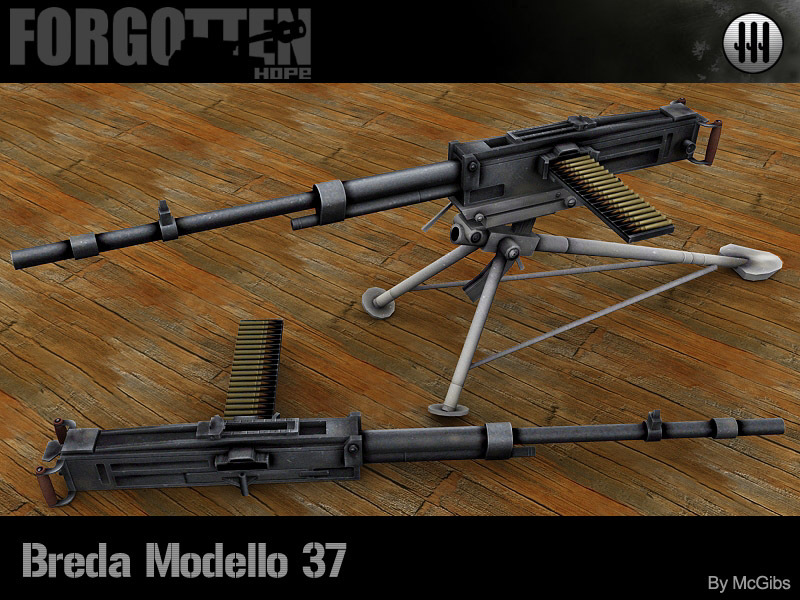 Also effective, though not without limitations, the Breda 37 represented perhaps the best of the various infantry weapons available to the Italian Army, outside of their excellent submachine guns. The use of lubricated ammunition invited stoppages, especially when introduced to the desert environment of North Africa. The Breda 37 typified the overall problems experienced by the Italian infantry. Every weapon outside of the submachine gun class included several unwelcome features. We hope you will enjoy them anyway.